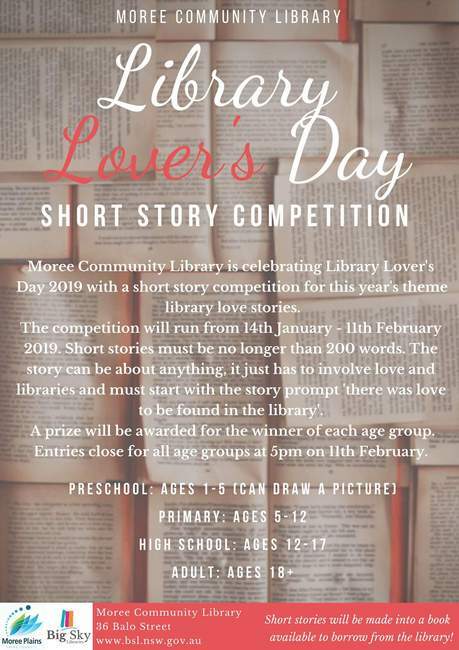 Moree Community Library is celebrating Library Lover's day with a short story competition for this year's theme library love stories. The competition will run from 14th January-11th February 2019. Short stories must be no longer than 200 words. The story can be about anything, it just has to involve love and libraries and must start with the story prompt 'there was love to be found in the library'. A prize will be awarded for the winner of each age group. Entries close for all groups at 5pm on11th February. Preschool: Ages 1-5 (can draw a picture), Primary: Ages 5-12, High School; Ages 12-17, Adult: Ages 18+.